We are committed to the independent retailer success. We opened our doors in 2007 and that marked the beginning of the GrillGrate craze that continues to grow each year. Today, GrillGrates are the number one grill accessory on the market. We are dedicated to making you the go-to retailer for the best tool available for grilling! Our “Store Locator” page is the third most visited page. Our goal is to earn your business by having excellent customer service to complement our excellent product. Why carry GrillGrates in your store? 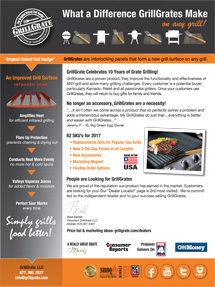 Award-Winning Products GrillGrates won the National BBQ Associations Award of Excellence 2011-2017. Champions Win With GrillGrates Renowned grill masters and BBQ champions have competed and won using GrillGrates, which proves once again that GrillGrates please the most demanding backyard chef. Independent Retailers Are Key To Our Success GrillGrate is committed to the independent dealer. This is why you won’t find GrillGrates sold in big box stores or all over the internet. 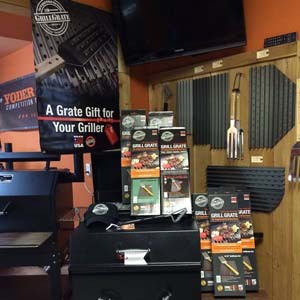 Over 70 SKUs for 2019 GrillGrate is a grilling system. Our line includes GrillGrates, griddles and tools for cleaning and handling. We continue to expand our product line in response to customer feedback and as new grills enter the market. Fast Shipping We ship wholesale orders within 1-2 days of receipt. Orders are shipped FedEx ground. Customer Service We have a lot of SKU’s and welcome your calls or emails to assist in ordering the right mix for your store. Made in the USA Given a choice between a product made in the USA and an identical one made abroad, 80% of Americans would rather buy American. GrillGrates are proudly American made. Why do your customers want GrillGrates? Put a silent salesman in front of your store! Sell GrillGrates to Your Regulars First. Your regulars are active grillers, and they buy the new stuff first. They listen to YOU and trust YOU. Your regulars are opinion leaders and likely the king of the grill in their neighborhood. Your regulars are also a referral system for you and your store. Display GrillGrates near your fuel or have the video loop playing near your fuel area. Set up a Silent Salesman in Front of Your Store. Roll a grill out to the outside entrance area of your store. Install GrillGrates, ideally on a gas grill, rails up and rails down. Place the “Meet the #1 Grill Surface” sign on the grill, and you have a GrillGrate greeter out front! Assume Everyone Who Comes into Your Grill Department Owns a Gas Grill. Ask your customers, “What kind of gas grill do you have at home?” Assume they own one – 90% of grillers own a gas grill. If they say Weber, boy do you have something to show them! Replacement sets for Weber gas grills are our #1 and #2 sellers. There are millions of Genesis, Spirit, and Summit gas grills in use and in good condition…they just need GrillGrates. They’ll thank you for the suggestion! Sell GrillGrates to everyone who buys pellets. Pellet grills and GrillGrates are peas and carrots! Display a sear station (3 panel set) with your pellets. Train your associates so that when they have a customer put pellets in their shopping cart- ask them if they have GrillGrates for their pellet grill yet. We call them sear stations for a reason. GrillGrates add the sear and sizzle to pellet grills that is often lacking. We have sear stations for all popular brands of pellet grills: Traeger, GMG, Louisiana, Yoder, and more. Are You On The Map? Be sure to be seen by all of our website visitors! Our Store Locator Page is the third most visited page on GrillGrate.com. If you are on the map, please check your listing for accuracy. If you see any discrepancies please email us any changes you would like to see made to your listing. Need some ideas on how to increase GrillGrate sales? Check out what some other retailers have done.